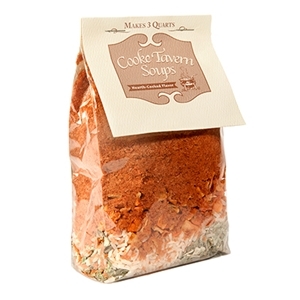 Cooke Tavern Farmer Al’s Homegrown Tomato Basil Bisque is a classic tomato soup with a spectacular gourmet flair! Simply add broth, diced tomatoes and cream to create a culinary inspiration of this time honored soup. Stir soup mix into cold broth and water, mixing well. Bring to a boil, cover & simmer for 30 minutes. Add diced tomatoes and simmer on low heat for an additional 10 minutes. Add half & half and serve. For a creamy bisque, puree using a food processor, blender or immersion blender. Garnish with croutons or grated cheese. Tomato, onion, carrot, brown sugar, basil, green & yellow pepper, celery, parsley & garlic.